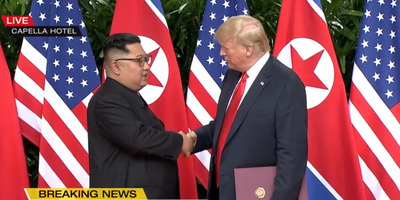 Screenshot/Channel News AsiaPresident Donald Trump and North Korean leader Kim Jong Un shake hands after signing an agreement. President Donald Trump gave a big signal that his meeting with North Korean leader Kim Jong Un went well. President Donald Trump said he will “absolutely” invite North Korean leader Kim Jong Un to the White House. The two leaders signed an agreement, the details of which were not immediately released, on Tuesday afternoon. After the signing a reporter asked whether Trump will invite Kim to the White House. “Absolutely, I will,” Trump said. In answering, it appears that Trump has yet to extend the invitation to the North Korean leader, who he also called a “very talented man” and a “very smart negotiator.” Trump also said the two learned a lot about each other and their countries. “Our whole relationship with North Korea is going to be a very much different situation than in the past,” Trump said. “[We] decided to leave the past behind. The world will see a major change,” Kim said through a translator. 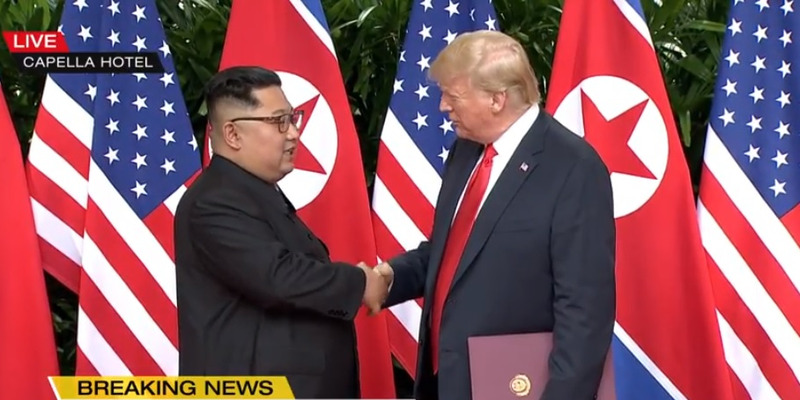 “We’ll be meeting again,” Trump said.